My name is Arturo Moedano, and I'm the sole proprietor of MSA Termite Systems. 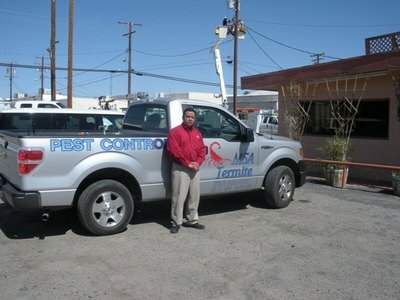 I've been an exterminator in Southern California and Southern Arizona for over twenty five years. I deal with all sorts of pests both in residential and commercial settings, and since termites tend to be the most destructive, I listed them in the company name. I pride myself on my ability to effectively diagnose and treat any and all pest problems. I'm fully licensed, bonded, insured and meet or surpass all government regulations. I use only the most environmentally friendly chemicals and in the smallest quantities necessary to do the job. If you have a specific problem or even a general question feel free to call me, and I'll discuss it with you and give you a free estimate if necessary. I don't believe in trying too hard to sell to anybody, rather I'll give you my professional opinion and respect your choice. House pests are some of the biggest and most common problems homeowners and business owners alike have to deal with at one time or another. It's fairly common to hear about families being driven out of their homes or businesses closing down because they could not eliminate or at least drive the unwanted "guests" from their homes and businesses. If you are in a situation where you need urgent professional help with the creepy crawlies that have invaded your home or place of business, you couldn't have come to a better place! Here at MSA Termite Systems, we take care of all your pest control needs in a fast, effective, and thorough manner in order to free your place of all your unwanted guests and give you back the peace of mind you deserve. With MSA Termite Systems, you can return to the normal course of your business or home life in just a short amount of time. If you're in Southern California and are looking for the most trusted pest control Brawley CA has to offer, you're exactly where you should be. Servicing Brawley, Yuma, and surrounding counties, we provide fast, reliable and highly effective pest control services to homes and commercial establishments in Southern California and Southern Arizona. Backed by over two decades of solid commitment to delivering the very best inspection, prevention and pest extermination services, we are the tried, tested and proven pest exterminator Yuma AZ folks trust the most. Whether it be termite control in Yuma, rodent control in Brawley, or bee & wasp control in San Luis, you can always count on the top-notch service we provide! If you want fast and effective professional pest prevention and pest control services for your home or business at very reasonable rates, come to the experts at MSA Termite Systems right away! This may come as a surprise but one of the best ways to protect and improve the reputation of your business and brand is to control rodents and birds. When most of us think of pest control we think of termites, scorpions, cockroaches, etc. but we don't usually think about rodents and birds. Rodents and birds can cause your customers to have a bad first impression about your business. Having a clean environment can make a big difference with your customers. There are also legal and economic reasons to control rodents and birds as well. Rodents in your home or place of business can cause harm in various ways. Rodents will not only ruin your insulation but can also spread disease. There are also various legal risks to having rodents in your place of business. Food contamination, health code violations and damaged stock are just a few of the ways that rodents can affect your business's reputation and cost you money. Most people don't think about birds as causing health risks but between losing feathers, droppings and other debris, birds can be a major problem when it comes to keeping your home or business environment sanitary. We understand that some people don't want to see any of these animals injured. After all, it's not their fault they are noisy and messy! I have effective ways of removing the problem without ever injuring one of the animals. Feel free to ask for more specifics on how I can help resolve your bird problems.